My guest on the Friday NI Rocks Show that was broadcast on 15th January was local legend Pat McManus. 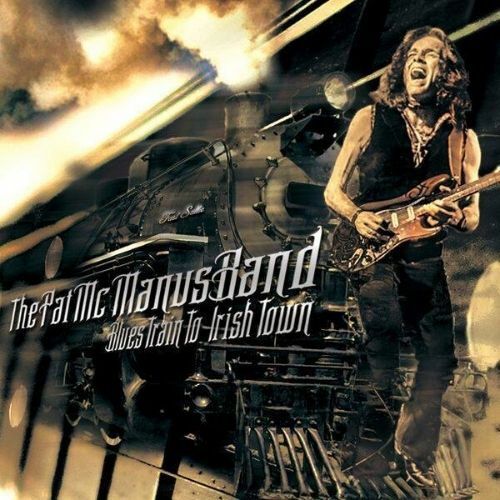 Back in November, Rock Radio NI hosted the Belfast launch gig for the latest album from the Pat McManus Band entitled “Blues Train to Irish Town”. 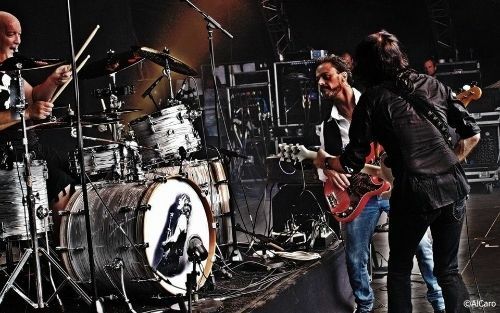 On the Show, Pat talks about working with renowned producer Chris Tsangarides on the new album which also includes his brother John on backing vocals, and he selects three tracks to play. Amongst the other things we chat about are the upcoming 10th anniversary gigs in the Diamond Rock Club (30th Jan and 6th Feb), touring with Gary Moore (and his support for a memorial), his friendship with the late Mudd Wallace and his memories of Lemmy. NI ROCKS – Hi Pat, thanks for taking some time to talk to us. I wanted to chat first of all about the latest album “Blues Train to Irish Town” which was released a few months ago. First question I guess is where did the album title come from? PAT – (Laughs) Well, there’s a story in the title itself. The thing about it is that I grew up playing a lot of trad music and folk music in general. This album starts off as a blues rock album then segues into a sort of celtic rock album. Kind of! Hence the title. People will get it. They’ve asked me about this recently and I’ve said that if you get the album you’ll hear as it progresses it segues about half way through into a celtic rock sort of influence, hence the title. NI ROCKS – Like other recent albums, “Blues Train to Irish Town” is released on the Rock House Music label. Am I right in thinking that is your own label? PAT – That’s right, yeah. NI ROCKS - Do you prefer being your own boss so to speak or would you be interested in a deal with one of the bigger labels? PAT – Well you know, the thing about the bigger labels; I’ve been down that road before. I have distribution deals throughout Europe and the world with Bad Reputation Records. They distribute throughout Europe. From that point of view I can keep a tight control of everything else. As regard to possible record companies – the advances that they give nowadays is not worth talking about. I much prefer to have control over all of that myself; it’s easier to look after the albums and see that they’re out in the right places and hitting the specific areas you want to hit. With record companies what happens is that they don’t allow you to sell records at gigs. They’ll say that you can sell them at gigs but you’ll buy them off us first – so you end up buying your own cd’s. It’s ridiculous and that goes for a lot of bands. Bands like Def Leppard would be in the bigger league, they’re signed to earMusic and they have a global thing happening there, but for the likes of me it’s far better to be in control of the situation. I can tell what’s happening and it makes life a little easier. I’m not interested in going with any major record label as you lose an awful lot and you become one of many artists signed to the label. You’re their priority maybe for a few weeks until something else comes along and that’s their priority. I’m happy doing it the way that I’m doing it. NI ROCKS – The latest album see you working once again with Marty McDermott on bass and Paul Faloon on drums. Does anyone else feature on the album? PAT – My brother John is on the album and there’s a little story there. I’d been talking to Chris Tsangarides who produced the early Mama’s Boys stuff and worked with Thin Lizzy, recorded “Parisienne Walkways” for Gary Moore. worked with Judas Priest and UFO; the list is endless. We’d always remained good friends and we were having a Facebook conversation and he said are we going to do an album or what? That got me thinking about it and I thought why not give it a go. To be honest I was quite happy working with the late, great Mudd Wallace who sadly passed away, but at that time Mudd wasn’t well and he’d said he was in no fit state to do another album and to go elsewhere with his blessing. That’s why I went over to do it with Chris. It’d been 30 years exactly since we’d done the last Mama’s Boys album together so it was a nice thing to do together. It was great for me to touch base with Chris again. He has his own studios in Deal in Kent and it was a fabulous experience. I did the whole album in five days, which was quite remarkable. I was very pleased with the outcome and it was fabulous working with Chris again. He is such a legend and we had a good laugh. I told John we were down with Chris and he decided to come down and when he was there I said you’re not getting away that easy, you can do some backing vocals for me. It was lovely to sing together again and it was an honour for me that John came down and did that. I was so pleased to have my bro back there doing the vocals again. NI ROCKS – You mentioned there Mudd Wallace who passed away recently and that he had worked on your first solo albums. PAT – He did the first four albums which I was immensely proud of. Mudd was a great friend, a fabulous producer and a great musician. It’s a big loss to the Northern Ireland music scene, it really genuinely is. He was someone very special and we got on really well as friends. I’d be in Europe touring and I’d text Mudd for advice and things like that. We had that kind of relationship; it wasn’t just about producing albums and stuff like that, we were really good friends. We had a mutual love of all kinds of great music. It was a sad day when Mudd passed away. NI ROCKS – Someone who died the same day as Mudd was Lemmy. Did you encounter Lemmy much during your travels with Mama’s Boys? PAT – Yes, indeed we did. We did a few things together. One memory sticks out in my mind. We were doing a festival in Mulhouse in France and it was called the Sunshine Festival and it got rained off (laughs). So we all adjourned to the hotel bar and Lemmy presented me with a pint of vodka and said drink this. I thought it was orange juice and to my horror discovered it was actually vodka and said thanks a million Lemmy but no thanks! We met quite a few times and did Dalymount Park together as well (Aug 1983). That was when Brian Robertson was in the band and in fact Chris Tsangarides was there that day too. He had worked with Lemmy on various other projects as well. It all came together that day, it was really funny. When we were recording in London we used to go to this pub called the St Moritz where all the rockers and rock people hung out, including musician, for a late night drink. Lemmy was always playing the slot machine in there. It was just known as Lemmy’s machine; no-one would go near it. The funniest story I think I have – I think Motorhead were signed to Bronze Records at the time and they became concerned about Lemmy spending so much money on the slot machine that they offered to buy him one (laughs), but he wouldn’t have it! He was a great man and he’ll be sadly missed. NI ROCKS – Yeah, it’s been a bad couple of weeks, with David Bowie dying today as well. PAT – It’s been a very tough few weeks. Time marches on and it doesn’t wait for anybody. A sad day today that a legend and pure genius is gone. He’ll be dearly missed, but his music will live on. NI ROCKS - We’re going to play a track from “Blues Train to Irish Town” now. Would you like to pick one and tell us a little about it? PAT – One of the tracks is more of a celtic rock thing and it’s called “Absent Friends” and it’s about my brother Tommy. I’ve written other songs about other musicians that I knew and I thought it’d be nice, in a round-about way to remember Tommy as well in a song. That’s the vague outline for the song. It’s really meant for all the musicians that we’ve lost who have meant something to me as a performer, who I grew up listening to. People like Gary Moore, Phil Lynott and people like that. 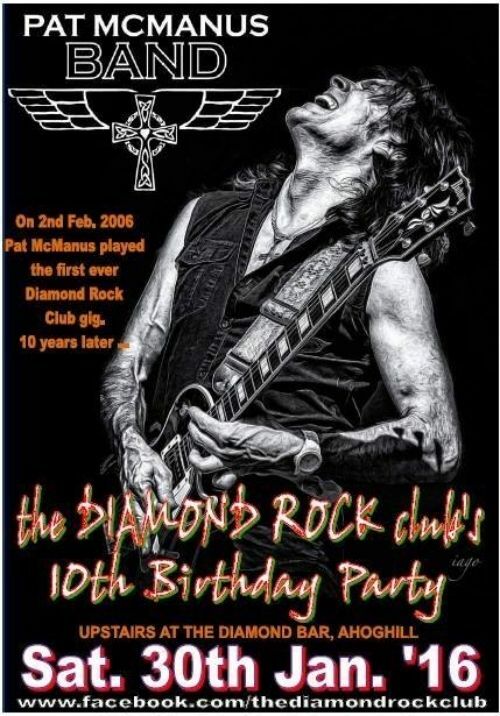 NI ROCKS – The next Pat McManus Band gig of 2016 is at the Diamond Rock Club on 30th January. That follows a New Years Eve performance and a gig in Masons on 2nd January A three week break without a gig seems to be a bit unusual for you? PAT – It is a little bit of a break. The lads have gone to various parts of Europe for a break themselves and I’m at home catching up with the kids that I teach because I’m not always about. For me it’s a chance to get in as much teaching as I possibly can for them. The next time we kick off is for the Diamond Rock Club tenth anniversary party – ten years since the Club started. I’m really looking forward to that because I was the first band to play there. It should be a really special night on Saturday 30th January. I can’t believe it’s ten years since we first played there. It’s a fabulous club and a lot of great bands play there. That’s going to be a really great night for me, personally speaking. NI ROCKS – That brings me on nicely to my next question. 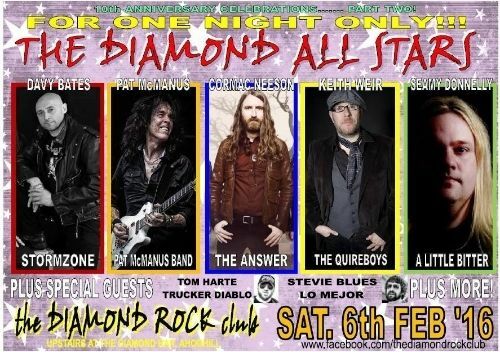 You’re also back in the Diamond Rock Club on 6th February as part of the All Star Band. Derwin tells me you’ve been on stage in The Diamond 27 times - either solo, with the Pat McManus Band or with others, 27 times. PAT – To be quite honest I’ve lost count how many times I’ve been there, but I know it inside out. It’s one of the places I always look forward the most to playing. It’s just got a really warm feeling and the people that come there are genuinely into their music. For me it’s home from home really. PAT – No chance to rehearse yet. I do know the setlist but I’m not going to tell anybody. (Laughs). I’m not giving anything away but I can tell you it’s also going to be a great night and I’m looking forward to it. NI ROCKS – The date of the All Star Band gig in The Diamond Rock Club also marks the 5th anniversary of the passing of Gary Moore on 6th February 2011. I should mention that there is a tribute gig planned for Voodoo in Belfast on the same night as the Diamond gig. I played your tribute to Gary – “Belfast Boy” – earlier in the Show. I presume we might get a few tracks dedicated to Gary in The Diamond? PAT – Of course we will. He was huge as rock guitarist. For me he was one of the greatest in the world and I don’t say that lightly. There are lots of accolades laid at many people’s doors but I can safely say that Gary was one of the true pioneers of the rock guitar. I think without Gary Moore you wouldn’t have all the great players you have today because they all listened very closely to what Gary had done. He was an exceptional talent and way ahead of his time. We’re still trying to catch up and getting nowhere close. He was just fabulous and what a fantastic song-writer as well. People talk about his guitar playing but he was absolutely fantastic song-writer as well. He was the full package. I still miss him and I put his records on religiously and listen to them. I was very fortunate to have toured with Gary in Europe with Mama’s Boys back in 1985. We went on tour and did France, Germany and Sweden together. It was a great tour to do. Sadly, my brother Tommy wasn’t on that tour because he was back home in the Royal (Victoria Hospital) in Belfast as he wasn’t well at that stage. He was getting better but we had contractual obligations to finish that tour. We hadn’t wanted to do it without Tommy, but Jimmy DeGrasso stepped in, who is now the current drummer with Black Star Riders and Jim was just awesome. At a minutes notice he came in, at the last minute and came to Derrylin all the way from L.A. (laughs). I don’t know what he made of it! NI ROCKS – A bit of culture shock there! PAT – There certainly was! We live on the shores of Lough Erne and we had him down fishing (laughs) – illegally I might say! He thought it was really rock ‘n’ roll. He stepped into Tommy’s shoes and did an amazing job and I’ll be forever grateful to Jimmy for doing that. What a great professional. So that was my memories of working with Gary – it was Jimmy that was with us on that tour. We all had a ball on that tour – it was a fantastic tour to do. It was a learning curve for our band as well, watching him every night up on stage playing and the musicians that he had with him – Bob Daisley and Neil Carter were just fantastic. I think it was Gary Husband on drums; I’m not too sure but I think it was. It was awe-inspiring for us. We couldn’t wait to put down our instruments and go and watch the gig. It was fantastic. So, yes we’ll definitely be doing a tribute to Gary that night. NI ROCKS - You’re a regular performer at the Rory Gallagher Festival in Ballyshannon each year. There’s the Rory statue in Ballyshannon and the Phil Lynott statue in Dublin, and recently a plaque for Cozy Powell in his home town of Cirencester. Do you think a memorial to Gary in Belfast is overdue? PAT – Completely, I’m really surprised that there’s not. We’ve got to get a campaign going to get Gary acknowledged. He, along with Rory, are probably two of the biggest guitar players in the world. We acknowledged Rory and rightly so, but I also think Gary will be, because he was a phenomenal player as well. I think we should all campaign to get Mr Moore a plaque, without a shadow of doubt. What a talent. NI ROCKS – It’s five years this year so maybe something will start to happen. PAT – These things take a little time. When these campaigns start to build momentum then people start to sit up and take notice. It’s up to the likes of us to shout it from the rooftops now that something has to be done. We’re very proud of him. NI ROCKS – I know they’ve organised that gig for Voodoo but unfortunately it’s the same night as the Diamond gig on 6th February. It’s Speedo Wilson playing guitar and Harry Hamilton from Flash Harry doing the singing. PAT – Oh, they’re great. I know both the lads. They’re fantastic men and fantastic musicians as well. That’ll be a good night as well. NI ROCKS – You’ve a very loyal fan-base in Northern Ireland. You and Sallie would know a lot of your fans by their names and would take the time to talk to as many people as possible. Does that familiarity add any pressure as you’ll know the audience will have watched you perform on many previous occasions? PAT – It’s all my Facebook friends. I’m amazed you know with their loyalty and they just show up and make it a fantastic night for me. I’m always panicking before I go on, wondering is there anybody out there, but they always turn up and make me very proud and very honoured. So I always try to go out and give 100% because they’ve made the effort and stuck with me. It’s fantastic, it’s like one big happy family when we get together. NI ROCKS – We’re going to play another track from your latest album now. Again, I’ll let you pick the tune and tell us a little about it. PAT – The track that I’d like to pick is called “Iona Sunset”. It’s the last track on the album and in many ways it’s a slow tune that has a very Irish / Celtic feel to it. It’s an instrumental tune and it’s something that I’ve always wanted to do with a guitar. It’s based loosely on an old trad tune that I knew as a kid and it got the rock treatment. People can make up their mind if they like it or not. NI ROCKS – The latest album has only been released for a few months and obviously you’ve plenty of gigs booked, but what next on the To-Do-List for you and the band musically? Another studio album a live album or something different? PAT – We start the tour on 5th March and we’re away for two months. We do various gigs in Ireland up to that point – we do Navan, Arklow, Dublin and The Market Theatre in Armagh on February 27th. So there are some shows to do here before we head off. What we normally do is get our heads in gear and come up with some songs that we haven’t done before. We’re doing quite a few off the new album which is great. It keeps it fresh and exciting for us. We’ll be putting in a few surprises as well to catch people on the hop and keep it fresh. We’ll get together when the lads come back from their hols and get into rehearsals and do some tracks we haven’t done before we head off. That European tour normally lasts about six weeks so it’s a long old haul, but we love it. We get on a roll and the band gets really tight and the gigs are really great fun then. So that’s really what’s on the horizon at the moment for the band. Promote the new album. Really, we haven’t hit Europe yet so this will be the first opportunity to play the new album there. Plus we’ve festivals and stuff throughout the summer to do. All part of the gravy train so to speak! NI ROCKS – You’ve worked with many other artists over the years and made many guest appearances. Do you get many requests and have you anything planned? PAT – If these things happen, they happen, if they don’t they don’t! Some of the most recent stuff I did was with The Quireboys. I may have done something after that, I can’t remember, the old memory is going. I did some stiff on Spike’s solo album that he did of Frankie Miller songs (“100% Pure Frankie Miller”). There are various artists on that and it’s a great album with people like Ronnie Wood, Andy Fraser and Simon Kirke from Free and a lot of great musicians; so it was a great honour for me to do that with him. And to work with The Quireboys, they’re one of my favourite bands. NI ROCKS – You mentioned playing with The Quireboys. A few years ago you went on tour with The Quireboys to play fiddle. Is that something you could see yourself doing again? PAT – You never know. I’m always up for suggestions. I’m quite happy to do it in whatever capacity. The last album I actually wrote some songs for was Wishbone Ash. I did their last album – I played fiddle and wrote a song as well. I’ve been a lifelong Wishbone fan and it was great to play with Andy, Muddy, Joe and Bob. They’re fantastic musicians and it was a dream come true for me to be in the studio when they were creating stuff and that they accepted one of the songs I’d written. It was very Wishbone Ash style and I was chuffed to bits that they deemed it good enough to use. NI ROCKS – I’m sure you get asked this next question fairly often. You and John performed together on stage in The Spring & Airbrake back in October 2011. With Steve Strange on drums. John lives in London. Any chance of another get-together on stage anytime soon? PAT – I really don’t know. I was talking to John a couple of days ago. We never say never. If the opportunity arises. It was for a great cause that night and he hadn’t intended to do anything. That was strictly just on the spur of the moment. He arrived over with Steve and I said you can’t not do something. He said I don’t even know the lyrics of the songs! If you’d have been there you would have seem me whispering some of the words in his ear because he couldn’t remember them (laughs). That’s how spur of the moment it was. There was nothing calculated about it at all. It wasn’t a reunion as we hadn’t intended to do anything. Never say never, but at the current time we have no plans to do anything together. People have said to us about all these bands that have reformed and got back together, but it wouldn’t be the same without Tommy. He was an integral part of the band – probably the most important part of the band. Not to have him there wouldn’t seem right. It wouldn’t be a reunion, it’d just be us paying tribute to the Mama Boys and to be honest I don’t really fancy doing that. I’m not saying that it’ll never happen, but at the moment we’ve no plans to do anything like that! PAT – Yeah, it’s funny, I couldn’t remember what key he sang it in. There were panic stations all around for everybody when we got up there. Thankfully we got through it all. NI ROCKS – You mentioned you were off on tour at the start of March, but looking at your website you’re booked fairly solidly from mid February through to the end of April. You’ve a run through Germany, the Netherlands, Belgium, France and Switzerland as part of that. Are those generally venues that you’ve play quite regularly – do you go back to the same places quite often? PAT – Some of them yes, but others not. But we always get a good following and it has been building. I haven’t really made a big issue out of the fact that I was in Mama’s Boys and a lot of the fans that I have now don’t make the connection until I actually tell them about it. I haven’t been using that as a banner to get into venues. I’m sure some promoters and agents are aware of it but it’s not something that I push. I don’t put “Ex Mama’s Boys” on the posters, it’s just the PMB. I’ve built up a very loyal following now. In the likes of Belgium, I’ve always had a good following right back to the very start of the solo projects. It’s a work in progress in places like Germany, but I’m very proud of what we’ve done. As I said I don’t use the Mama’s Boys as a vehicle to promote the PMB and I’m quite proud of the fact that we’ve done that ourselves. NI ROCKS – Your own band never really received the level of recognition in N America that you deserve. Do you get many requests to play any of the Rock and Blues festivals over there and is that a market you’d like to target more? PAT – No. We have been asked to go over, but to be quite honest with you, by the time that you’ve sorted out fees and all that, I can’t be bothered. I’m not being blasé about it; yes if the right festival came in and they were prepared to sort all that out for you. I know several musicians who go out there to play and it’s a nightmare. At my stage in live, I just can’t be bothered (laughs). That’s not being lazy; it’s just so much hassle. I always say America is full of great musicians, what do they want me over there for! America was a big stronghold for Mama’s Boys and we did exceptionally well over there. Sadly with Tommy’s illness we never got to capitalise on it. Our album and our singles were doing really well so there is a lot of fans there and I get a lot of people coming on looking and making enquiries, but I always say it’s easier for them to come over than it is for us to go over and play for them! If the right tour or package tour came along - a sort of nostalgic 80’s musician package – I could do something like that. That would be worthwhile. NI ROCKS – Pat, that’s all the questions I have - thanks again for taking the time to talk us. We’ll finish off with another track from “Blues Train to Irish Town”. Which one would you like to play and tell us a little about it? PAT – The track I’d like to pick is “Stepping Stone”. The two previous tracks I picked have quite a celtic feel to them. This one is more of a bluesy feeling and it’s just a straight up ballsy blues tune and I’m very proud of it. It’s turning into a favourite at the gigs at the moment. Nothing really much to say about it other than its one that goes down really well and we’ve mastered it and manage to capture the song in its full format. From our point of view it’s one that has become a great live track.